It’s been a year of firsts for Amanda – her first apartment; first Christmas tree; first time meeting royalty. Four years ago, she never would have dreamed of such a year – not until she found The Door. 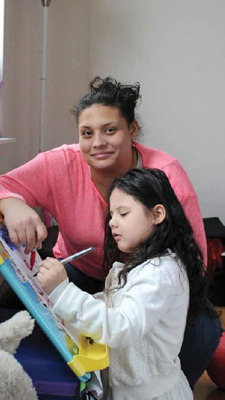 Today Amanda is working with The Door on getting her GED and she takes advantage of our partner University Settlement’s affordable preschool program for her daughter. She plans to go to college to pursue nursing or social work. And she recently got to swap stories of motherhood with someone very special – the Duchess of Cambridge, during the royal couple’s visit to The Door. There are approximately 3,800 homeless youth in New York City on any given night, however only 6% can secure housing with the current number of designated apartments for youth. With two supportive housing buildings, The Door is one of NYC’s leading providers of permanent housing for youth who have been homeless or in foster care.